Nothing goes with culture better than food. 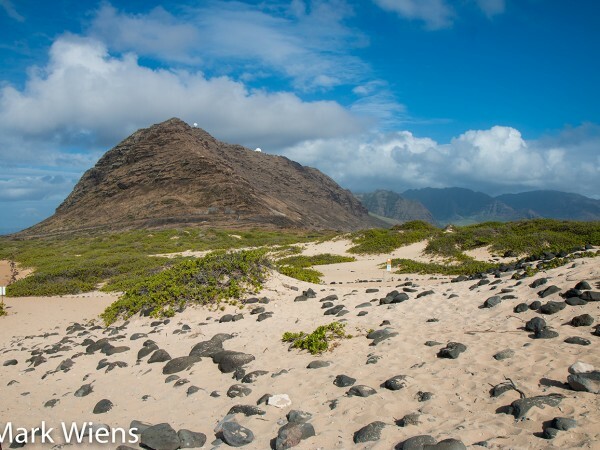 When we were in Hawaii, my wife Ying and I were invited to the Polynesian Cultural Center to explore the different Polynesian villages, and to experience Polynesian food. 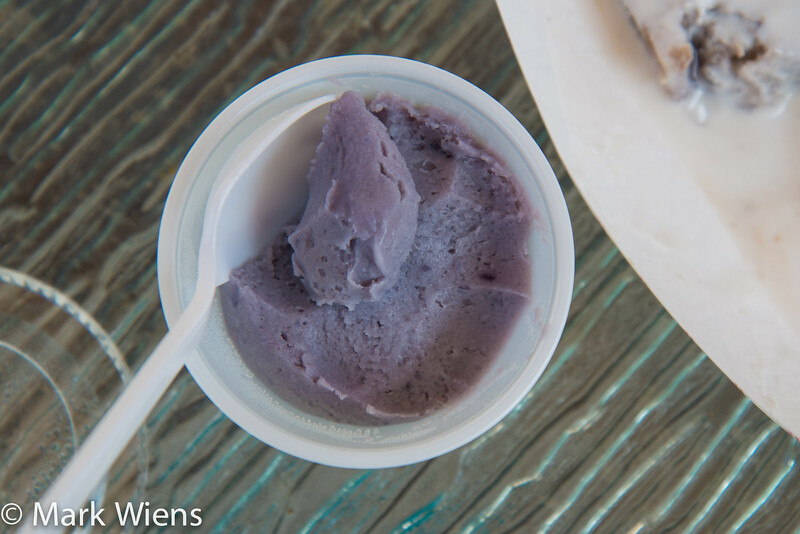 I got to try some of the popular snacks and foods from some of the major Polynesian islands, and I’m about to share everything we ate with you in this blog post. Right after we put the pig to rest in the imu, we walked around the Polynesian Cultural Center for a Taste of Polynesia. The Polynesian Cultural Center is a cultural center in the small town of Laie, towards the north shore of the island of Oahu, Hawaii. 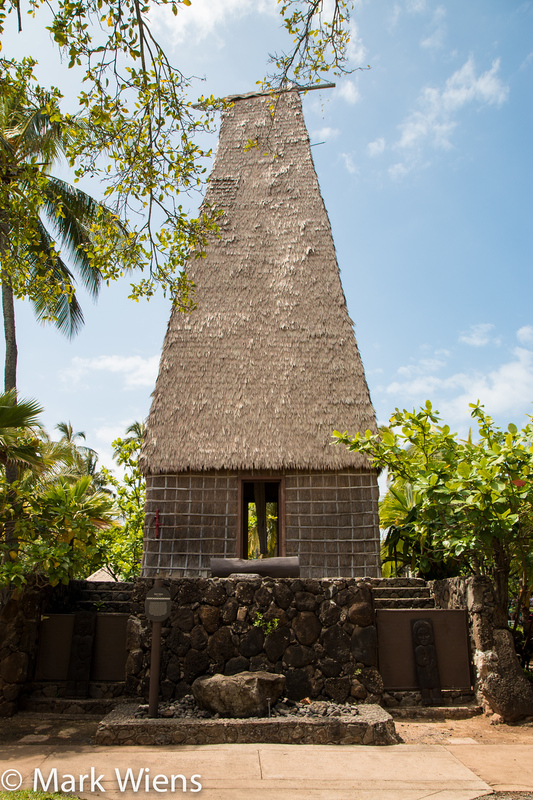 The center is set up as a place to preserve and to learn about the major cultures and countries of Polynesia, and they do a great job of making it a fun and entertaining experience. The countries represented include Hawaii, Fiji, Samoa, Tahiti, Tonga, and Aotearoa (New Zealand). For each country there’s a traditional home and village setup, each showing a glimpse into the local life on that island. Each country has a show schedule, where employees, typically from the country they are representing, dance or sing or perform a show from their country. 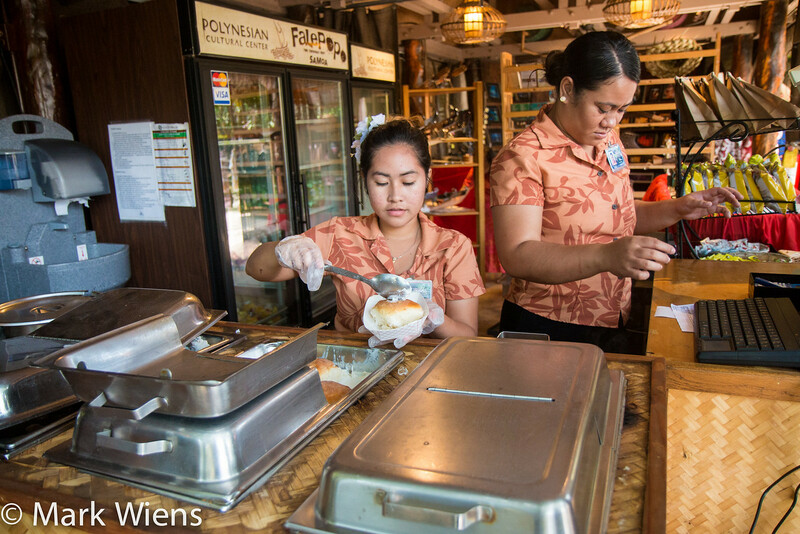 There are a number of snack bars located throughout the villages, and along with serving a small selection of typical refreshments, there’s also the “Taste of Polynesia,” where a few local snacks or light meals are served from the country represented. 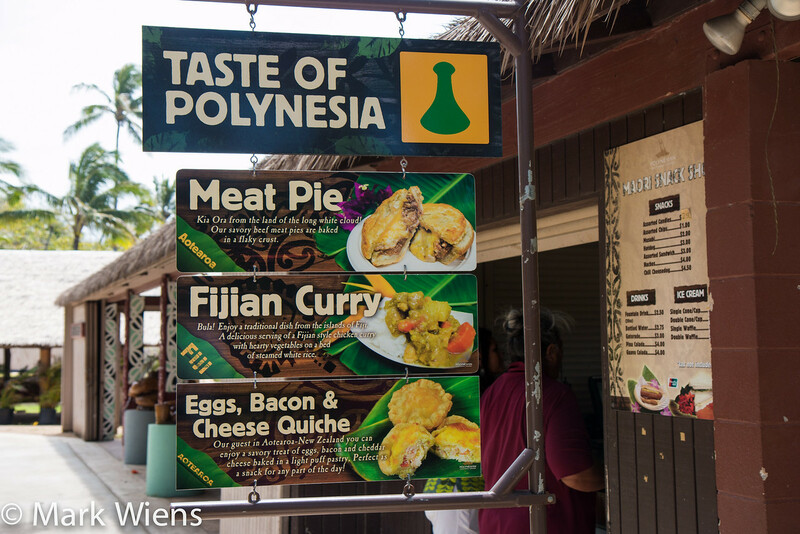 When we visited the Polynesian Cultural Center it was our mission to move from village to village and sample all 9 Polynesian foods on the Taste of Polynesia menu. Our first stop was at the village of Samoa. By the way, if you have time to attend the Samoa village show, it was pretty entertaining. They showed all the uses in the Samoan culture for the coconut, from eating the meat, to using the husk to start a fire, and even using a coconut to play rugby. 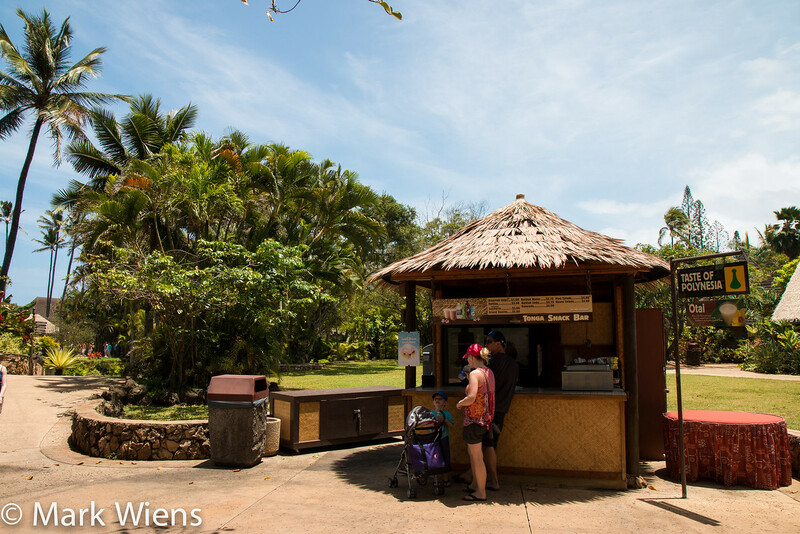 The snack bar had a number of typical snacks like chips and sodas, but I went straight for the Taste of Polynesia menu and ordered one of everything they offered. 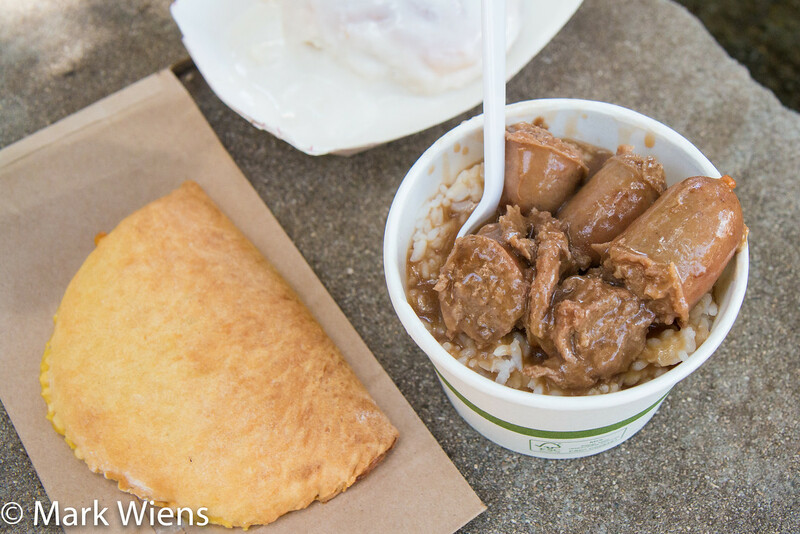 The first thing we tried was sausage and gravy, similar to bangers and mash, but with rice instead of mashed potatoes. Due to the strong British influence throughout the history of Samoa, there are many similarities and influences in the local modern cuisine. 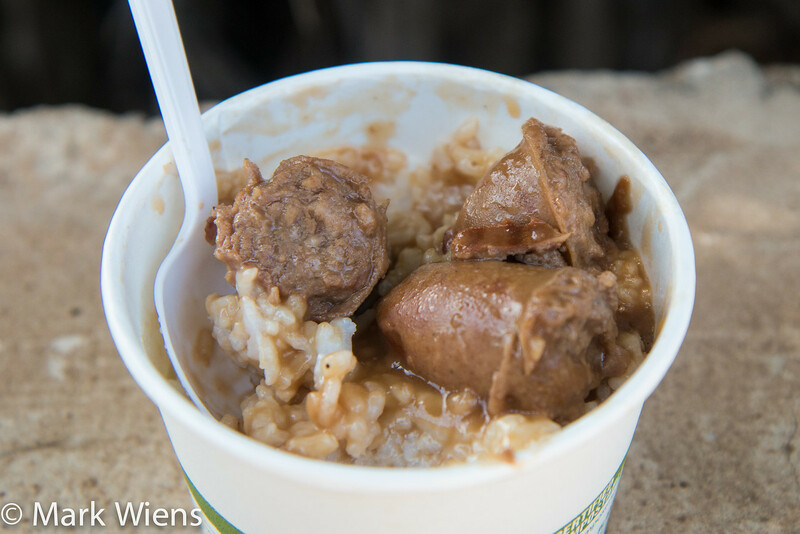 The sausage was cut into large bite sized pieces, and cooked in thick brown gravy. It was nice and meaty, not too fatty, with a good texture and flavor – overall I thought the sausage was very good quality. The gravy enhanced it even more, and went well with the rice as well. Next up was panipopo, something I had never seen or tried before. 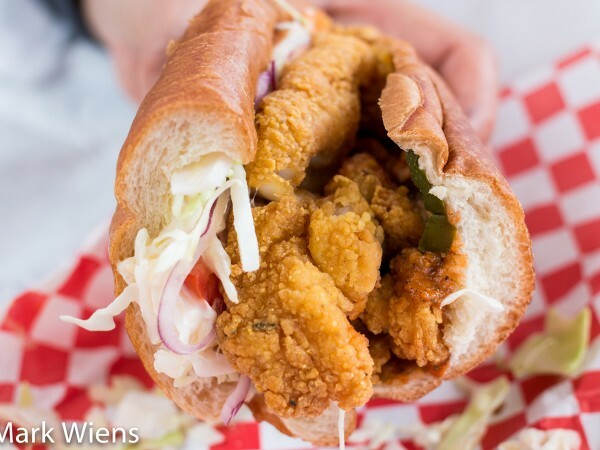 As soon as I ordered it, she added a fresh and still warm roll to a paper plate, then topped it with a few spoons of thick coconut creamy gravy. 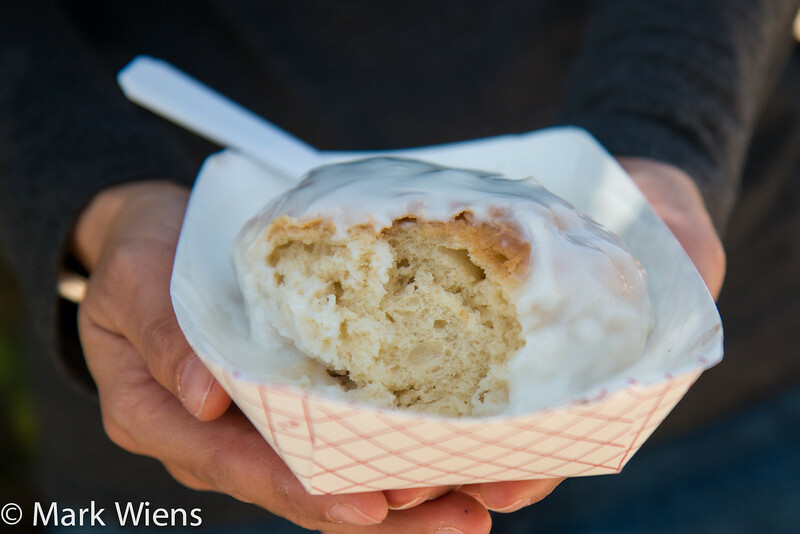 The roll wasn’t sweet on its own, it was almost like a white bun, very fluffy and airy, with a wonderful lightness to it. The sweetness came from the coconut cream, which was thick like gravy, and lightly sweetened. The combination of bread and coconut cream made the panipopo kind of like cake and frosting, except lighter and not as sweet. I’m not a big sweets eater, but I thought the panipopo was pretty good, and my wife especially really enjoyed it. 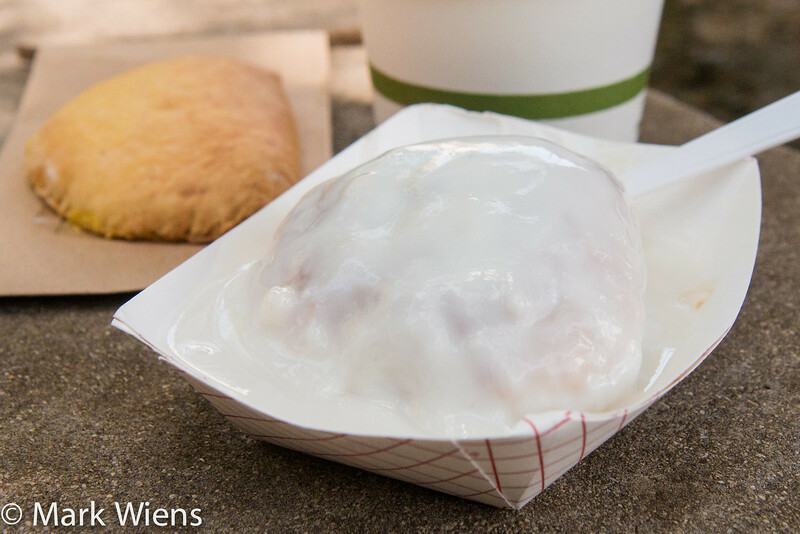 Our last Polynesian snack at the Samoan village at Polynesian Cultural Center was a Half-Moon pineapple pie, which came shaped like an empanada. The pie was filled with a pineapple flavored creamy inside that was custardy and silky smooth. The outside dough wrapper was nice and crumbly. If you like pastries, this was pretty good, but I enjoyed the panipopo better. Moving on, we meandered our way over to the village of Tonga, where there was just one thing on the Taste of Polynesia menu: ‘Otai. Made with seasonal fresh fruit, ‘otai is a milky fruity beverage found throughout parts of western Polynesia, especially in Tonga. During the season we went, they were offering it with lychee, peach, and green apple, but they change the fruits throughout the year, so it will depend on when you visit. It was sort of a cross between a milky beverage and a pudding, but it was liquid enough to drink without needing a spoon. The fruit was in small pieces and partly pureed, but it was still nice and pulpy. The ‘otai was almost like a milk fruit salad. For me it was a bit too sweet, but it was nice and refreshing while walking around on a hot day. 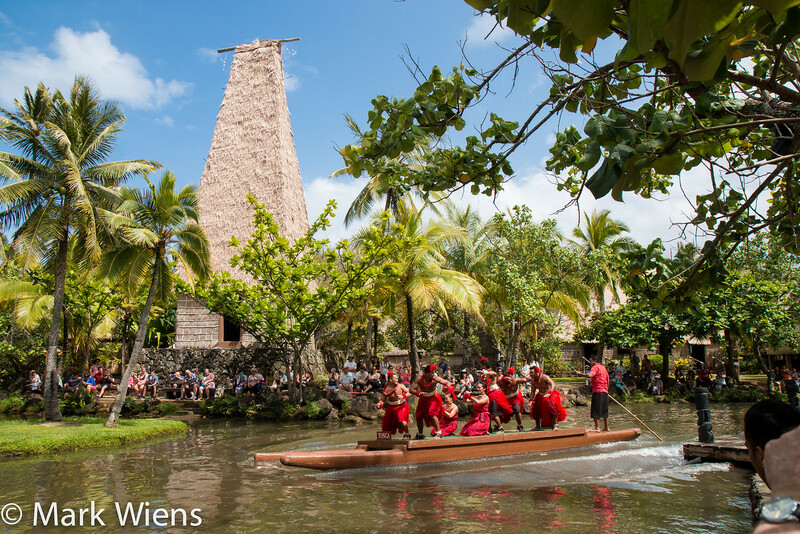 While eating through the Polynesian Cultural Center we passed through all the villages, enjoying some of the shows along the way. At 2:30 pm each day is the canoe pageant, where each of the countries performs a dance on a boat while gliding through the river that runs through the middle of the center. The show was very good, very entertaining, and what I really liked was the traditional clothing and outfits of each of the countries, and the differences, yet similarities, between the islands. Proceeding on our Polynesian food adventure, we made our way to the next snack bar, this time for a couple more sweet desserts from Hawaii and Tahiti. 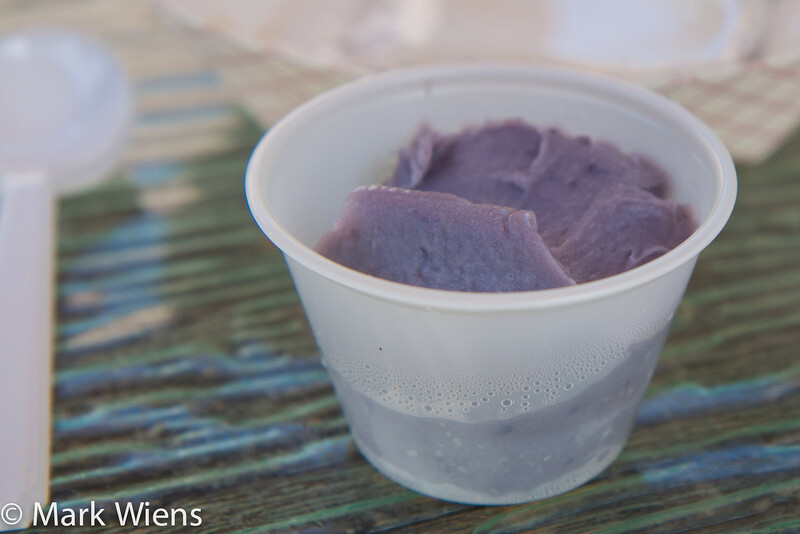 Though I’ve been to Hawaii many times, this was my first time to try koelepalau, a purple sweet potato coconut pudding. The koelepalau had the texture of mashed potatoes, but it was more sticky and glue-like, almost like a cross between mashed potatoes and peanut butter – it sort of stuck to the roof of my mouth, but in a good way. It wasn’t too sweet, mostly naturally sweet from the sweet potato and the coconut milk. I thought the koelepalau was very good, and this was one of my wife’s favorite things we ate during the day. 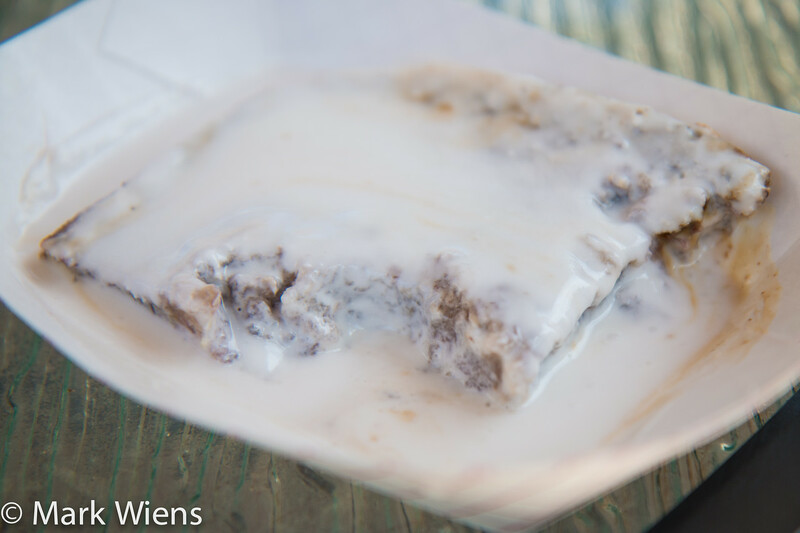 Next up was a Tahitian po’e, this version prepared with bananas, and made into something like a fruit cake or pudding, then baked, and covered in coconut cream. What I loved about the Tahitian po’e was that, as they told us, the recipe didn’t use any sugar, but rather just relied on the sweetness of the bananas. 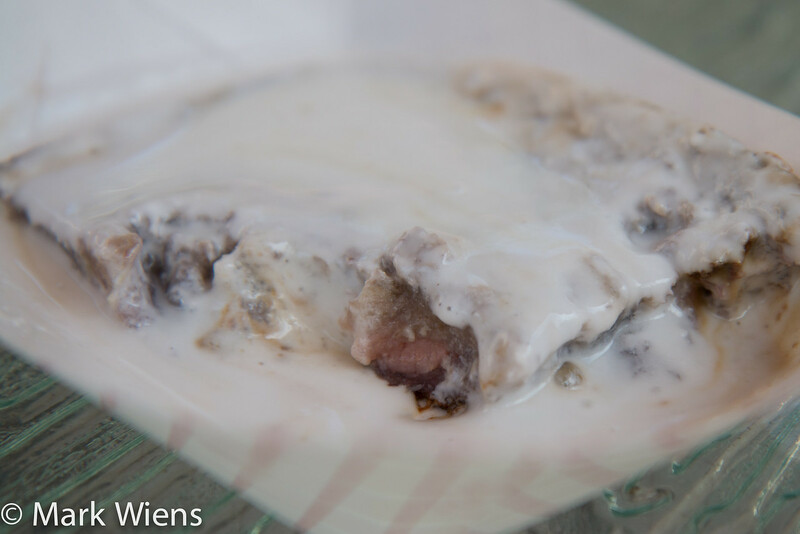 The bananas were extremely ripe, then baked with a bit of tapioca starch so they turned pudding like and slightly gelatinous, and finally topped with coconut cream that wasn’t sweetened either. 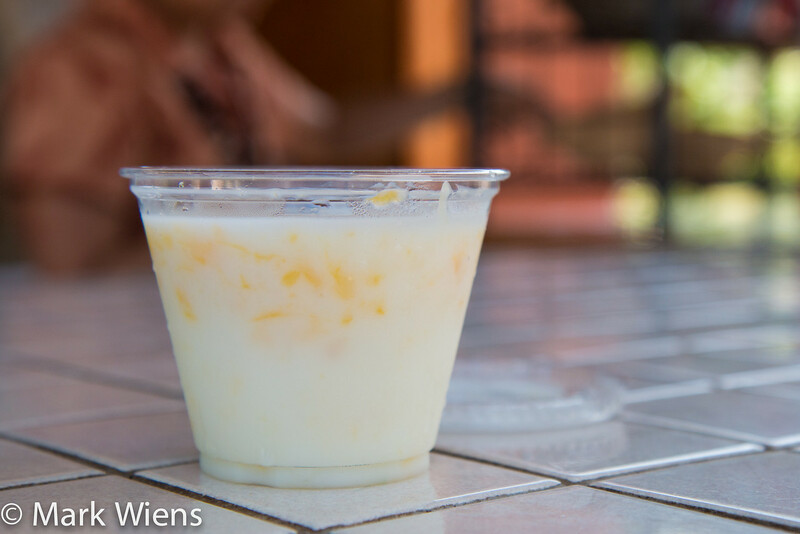 It think this was my favorite dessert of our Polynesian food tour, great flavor, rich from the coconut milk, and not too sweet. Our last stop on the Taste of Polynesia food tour was halfway in-between Fiji and Aotearoa (New Zealand). Since I had eaten a few sweet dishes already, I was more than ready for something salty, and at this next stop all three items were. Any type of curry, from India to Thailand, has always been one of my favorite genres of foods in the world, so I was happy to see Fijian curry on the menu. Fiji has a large population of Indians with a strong Indian influence in the culture and cuisine. 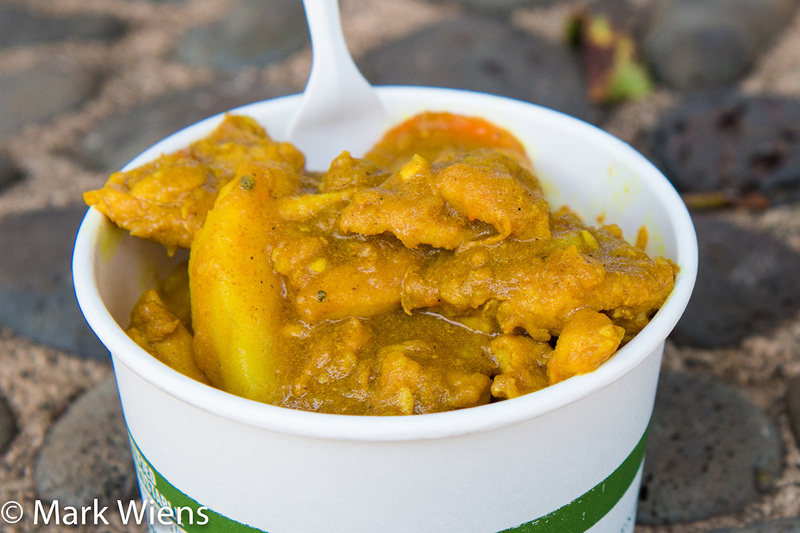 This Fijian curry, which was cooked with chicken, was made from a family recipe from one of the Fijian staff at the Polynesian Cultural Center. 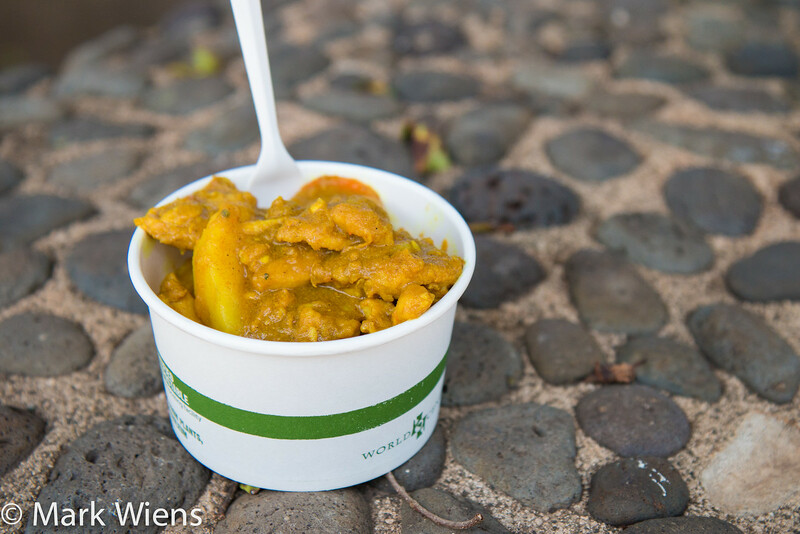 Without doubt, the Fijian curry was my favorite dish of our food tour. The chicken, carrots, and potatoes were all tender, and the sauce was nicely flavored with curry powder, the cumin and turmeric coming through nicely. Along with hot steamed rice, it was my style of comfort food. The Fijian curry was the best dish for me. 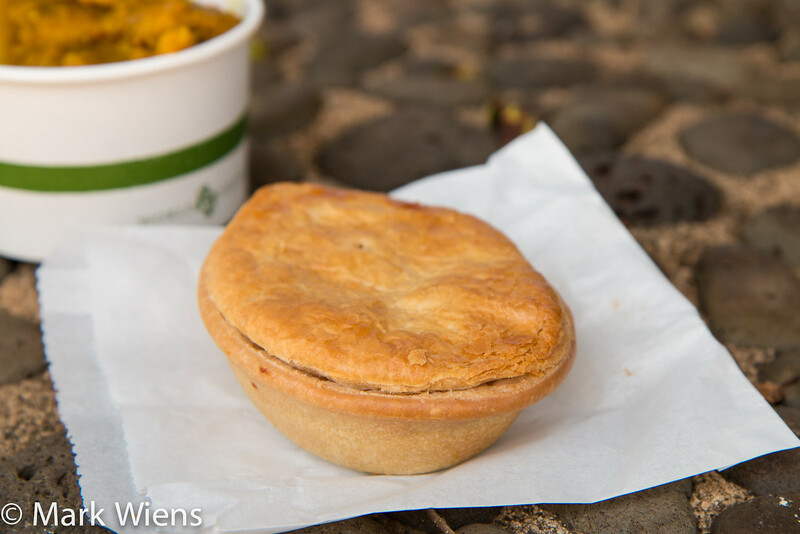 I’ve never been to New Zealand (although I would love to visit), but under the influence of Britain again, meat pies are extremely common and loved. 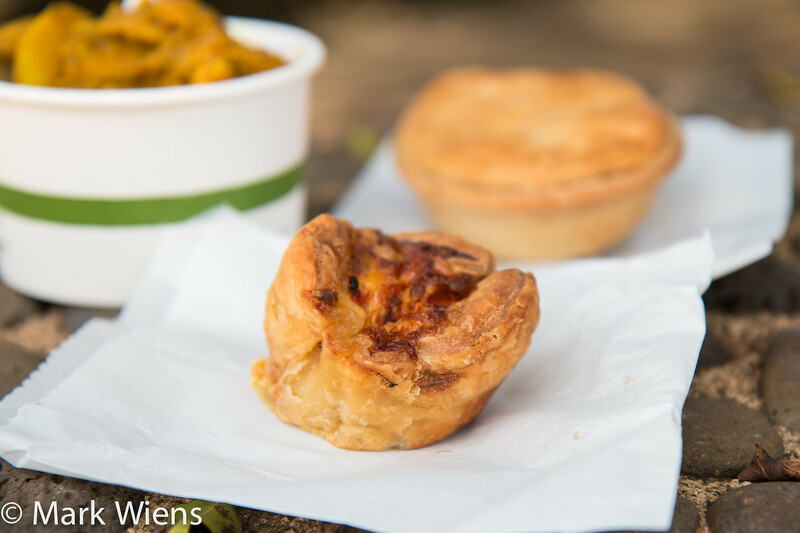 This meat pie was filled with minced beef and cheese, wrapped in dough, and baked. 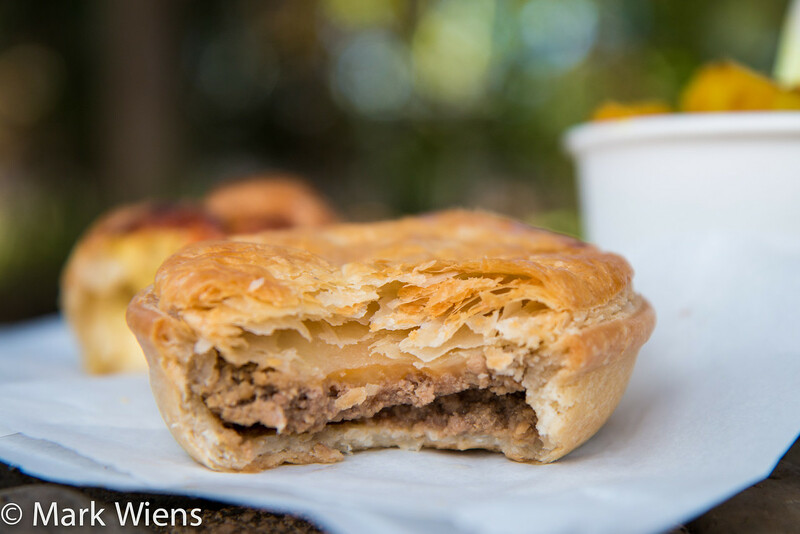 The meat pie was also very good, and it included a good amount of minced beef topped with cheese, and a nice ratio of insides to dough. The bottom of the dough was slightly gooey and soft, while the top was flaky and crispy. 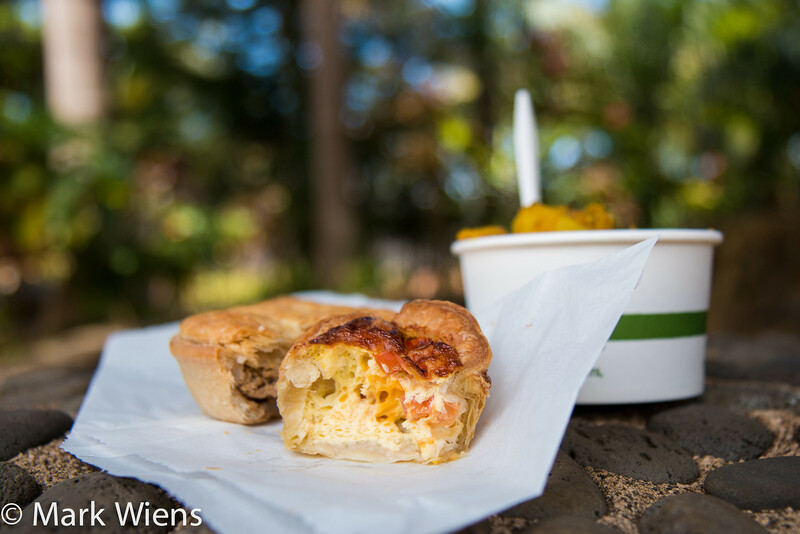 For meat pie lovers, this is a satisfying snack option when you’re walking around the Polynesian Cultural Center. The egg, bacon & cheese quiche was pretty tasty as well, a little puff of pasty dough, filled with egg, cheese, and bacon stuffed into the middle. I ate all the bacon in my first bite! It was served out of a hot box, so it stayed warm when I ordered and ate it. 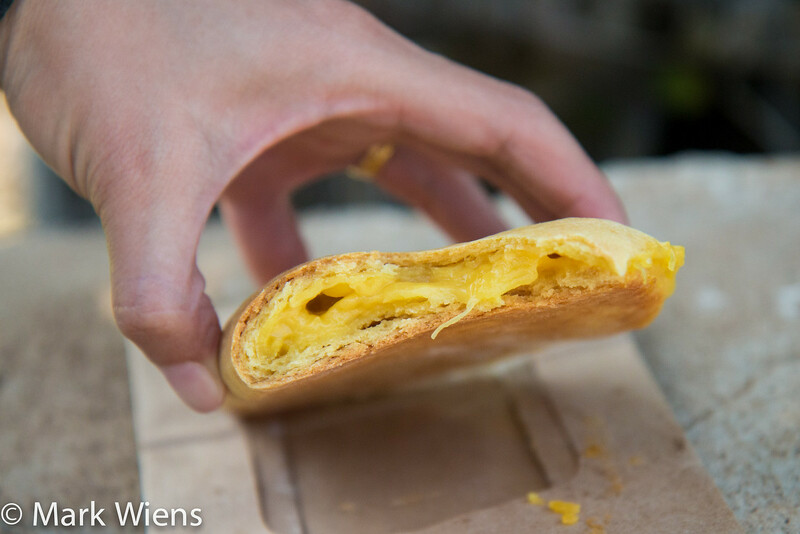 The pastry was flaky and buttery, and the inside was like a fluffy omelet. This final snack hit the spot, a salty and crunchy snack. The Polynesian Cultural Center is an attraction in Hawaii that highlights the major island nations of Polynesia in a series of villages, performances, cultural displays, and a few snacks bars that serve a variety of Polynesian foods. 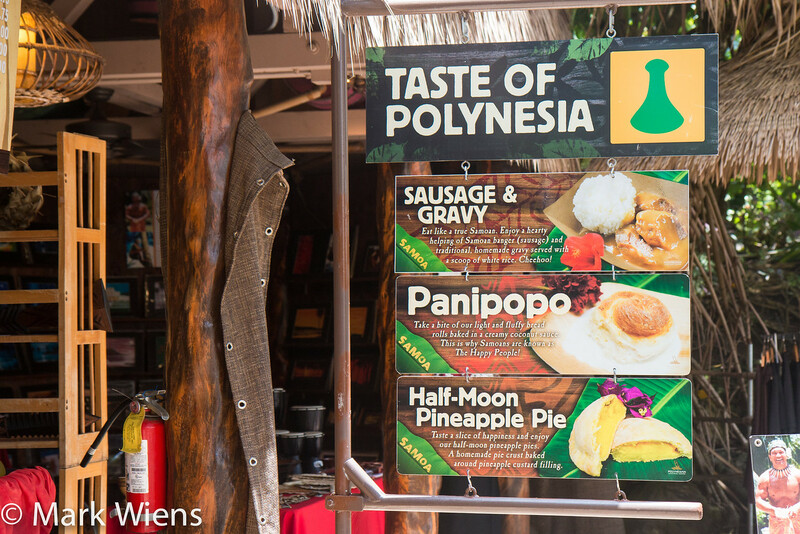 My wife and I had a great day exploring the center and we managed to eat all 9 foods from the Taste of Polynesia menu while walking around. Food has always been the reason I love to travel, so in my opinion there’s no better way to learn about the islands of Polynesia than by tasting them. 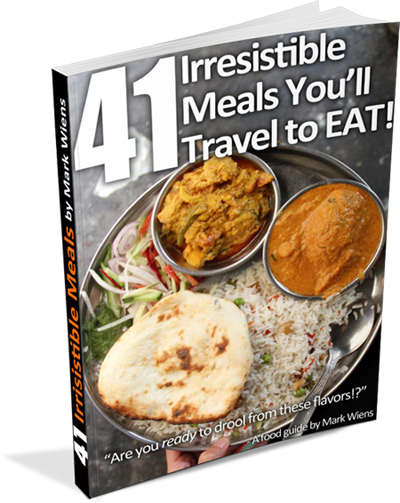 Of everything I ate, the Fijian curry was my favorite! 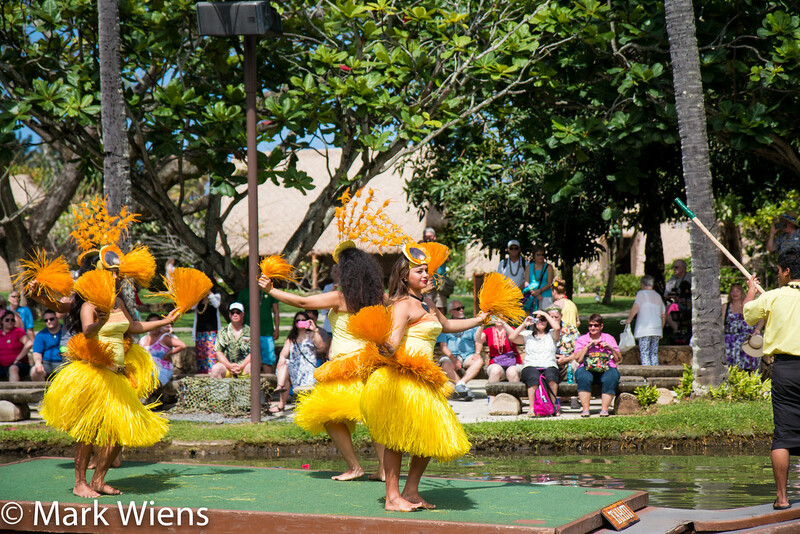 NOTE: I was sponsored for the day at the Polynesian Cultural Center, so I got free entrance and food, but I wasn’t paid to write this blog post, and as always, all opinions throughout this blog, thoughts, photos, and videos are my own. Not many choices if you are a vegetarian. 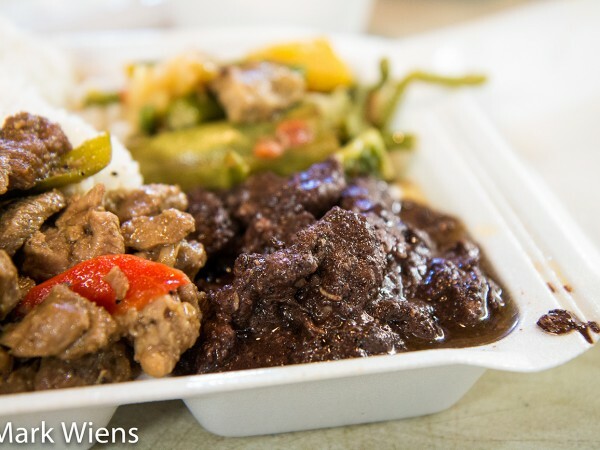 Hi Mark Wiens, Thanks for sharing such excellent photos of Polynesian Foods and this was a great read. Tahitian po’e is very popular,indeed. Raw fish like “mahi mahi ” or the parrot fish, eaten marinated in lime juice and coconut milk are also typical in French Polynesia. Wow! Great content and pictures. Make me jealous for taste all of this food. 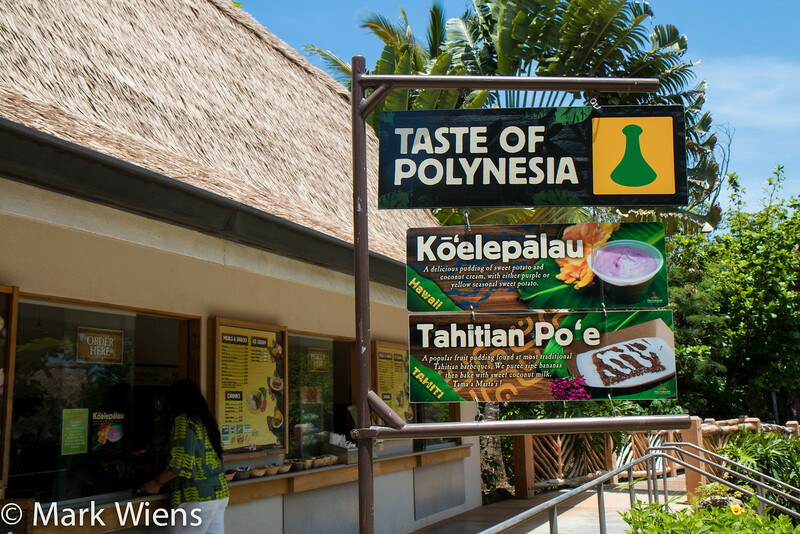 Thoroughly enjoyed reading this article about the Polynesian Cultural Center and detailing about the delicacies.